Elegant can be simple; flavourful can be fast and easy. Imagine pasta tossed with tender chicken in olive oil, garlic, and fresh kale. Don't just sit there.... you can have this dish ready from idea-to-plate in fifteen minutes! Cut the soft kale leaves off the spine and finely chop. In a sauté pan, mix the chopped kale, lemon juice, chopped garlic and salt. Cover the dish and turn the heat on "low." Get the water started to boil the pasta. Chop the chicken, and add it to the kale mixture. As it is cooking, toss the chicken and kale with tongs. It should cook pretty quickly at medium heat. Cook you pasta of choice as soon as the water boils. (Angel Hair Pasta is the fastest, with four minutes' cooking time, so be sure that the chicken is done before putting it in the water.) 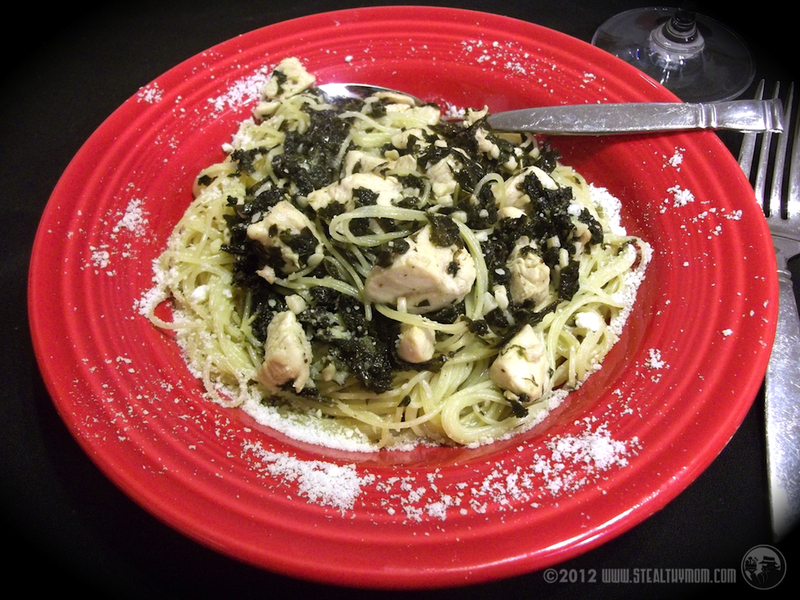 With tongs, take the pasta straight from the water to the sauté pan and toss it with the kale, chicken and oil. Serve immediately, optionally garnishing with parmesan cheese. This looks delicious! Thank you for sharing on Foodie Friends Friday! Please come back on Sunday to VOTE! This is the way I love any kind of greens....mixed with pasta. Thank you for sharing at Foodie Friends Friday. Your Chicken Clarinda looks delicious, we will just love it. Thank you so much for celebrating TWO YEARS with FULL PLATE THURSDAY, I appreciate your visit! I love a quick, easy meal and this looks wonderful. Thanks for sharing!